Over the years, encouraged by his gurus and fellow musicians, Neyveli Skandasubramanian has become one of the most sought after mridangam players. Impeccably dressed, he can be identified at once thanks to the sacred ash and vermilion on his forehead and his broad smile. Skandasubramaniam recalls some memorable moments in his musical journey. My father B.Y. Sundararajan learnt mridangam from Poovalur Venkatraman (a disciple of Palani Subramania Pillai). Compelling family circumstances made him take up a teacher’s job in Neyveli. His unfulfilled desire of becoming a mridangam player was in a way responsible for what I am today. Neyveli Balasubramaniam spotted my love for rhythm and put me under Tiruvarur Krishnamurthy of AIR Pondy, who was frequenting Neyveli to conduct classes. In a year, there were only four or five classes. But I would continue practising. Then there was a lull for four years. But my father was determined and took me to Tiruvarur Krishnamurthy’s house at Pondy. Soon classes began during weekends and holidays. The only difference was I had to travel to Pondy every time. Playing for Srirangam Ranganathan’s vocals regularly helped immensely. Also, my sister, a qualified musician, would sing at home so that I could practise. Even as a child, my mother would take me and my sister to all concerts in Neyveli along with my grandmother, who was a good singer. I have listened to many veterans. Music was always my first choice when compared to games in the township. I would never miss concerts even during exams. Competing with my sister, I would run to the main gate to grab the concert notice for the month when it was being distributed. Listening to concerts in AIR was another highlight. D.K. Jayaraman’s performance with T. Rukmini and R. Ramesh is still etched in mind. We were in awe as we had listened to him only on AIR. That day, we never wanted the concert to end. The way he encouraged young R. Ramesh was something incredible. Regular bhajans and annual Radha Kalyanam were part and parcel of Neyveli life. Pudukottai Sanjeevi Bhagavatar would stay in our house when he came to participate in the Radha Kalyanam festival. It was he who made me play for his bhajans. I received my first ever sambhavanai of Rs.75 from him. Playing for bhajans regularly improved my skill, what with varied style, different talams and tunes and long hours of non-stop playing. After completing DME, I immediately got a job. Tiruvarur Bhaktavatsalam, a nephew of my first guru, knew me even during my Neyveli days. After convincing my parents, he made me take up mridangam full time. Then I moved to Madras. His words of encouragement helped me overcome my initial diffidence in a new atmosphere. His mother T.R. Aanandavalli sang a lot for my practice sessions. Bhaktavatsalam made me participate in several competitions and in the first year of my entry, I won prizes at The Music Academy, IFAS and MFAC . Incidentally I got the Government scholarship to learn mridangam under him. Winning competitions earned me a few concerts. My guru also recommended me to many artistes, and sabhas. S.V. Krishnan of Raga Sudha boosted my morale by featuring me at least twice a month. One such concert for Rajee Gopalakrishnan really pushed my career ahead. My maiden tour abroad was with her, arranged by Cleveland Sundaram. Playing for veena vidwan K.S. Narayanaswamy in the presence of M.S. Subbulakshmi is something I will cherish forever. At the end of the concert, Veenai Vasu virtually lifted me from the stage on his shoulders, showering praises. After playing at a few concerts for Sudha Ragunathan, there was a gap. Then, all of a sudden, she called me up and asked me to accompany her. There was no turning back after that. Accompanying her for concerts, there has not been a place that I have not visited both within India and abroad. O.S.Thiagarajan is a big source of inspiration and so is T.V. Sankaranarayanan. Playing for Priya Sisters, Nithyasree Mahadevan, Sikkil Gurucharan and many others regularly, has helped me adapt to different styles. Our house in Neyveli would always ring with Tiruppugazh. My parents, brothers and sisters were all good at it. These hymns of Arunagirinathar are the ultimate statement on rhythm. Taking part with T.V. Sundaravalli in her Tiruppugazh concerts and albums has been soul satisfying. The blessings I received from Kanchi Paramacharya when he released the first Tiruppugazh CD of T.V. Sundaravalli at the Mutt and the pat on my cheeks from Sathya Sai Baba after I played with Priya Sisters in Puttaparthi… I will never forget those moments. On the days I have concerts, I get up early and set my mind for the evening’s concert. Tuning myself to the style of the artist whom I am going to accompany that evening goes on the whole day. By the time I leave my house, I am all set. On concert days I never undertake any domestic work. Non-concert days are reserved for my family. Devotional singer Bhavdeep Jaipurwala is to release an album in praise of Bhagavan Sri Sathya Sai Baba. His forthcoming album “Sathya Sai Baba” is also sung and composed by Sumit Tappu. “The album comprises of nine songs which are not the typical bhajans, in fact we have kept the music contemporary. It is different from what has been sung so far for baba, so I am sure people will like it,” informs Bhavdeep Jaipurwala. The album will be releasing in November in Puttaparthi, Bengaluru. “We are releasing it in Puttaparthi as 15 years back we had released an album called Sai Darshan, which went on to become one of the bestsellers so far among the devotional music,” he shares. Hopefully this time too Sai makes their belief stronger with the success of yet another devotional stint. Paulus Panggabean lives the good life. He’s not exactly on vacation 24/7, but it’s close. As the general manager of Hard Rock, Paulus splits his time between Bali and Jakarta. He lives it up in two of the countries hottest spots, meeting the coolest people and listening to the best music—and he gets paid to do it. The tattooed father of four sat down to quell our jealousy, talk about his favorite piece of Hard Rock nostalgia and let us in on the mystery surrounding the origin of the Hard Rock name. Question: How many Hard Rock T-shirts do you have? Paulus Panggabean: So many … I don’t even know. Hundreds. Question: How did you land the job as general manager of Hard Rock? Paulus Panggabean: I was working in Mulia Tower on Gatot Subroto and one day I read an advertisement that a Hard Rock was going to open here, and I love Hard Rock. Before that, I worked on a cruise ship and my roommate on the ship had worked at Hard Rock Singapore, so he told me the history of Hard Rock, everything about it. So when I went in for the interview, I impressed the GM from Singapore with how much I knew. I’d always dreamed of working at Hard Rock. Question: Where and when did the first Hard Rock open? Paulus Panggabean: In London, in Hyde Park, June 14, 1971. There are so many stories about Hard Rock and how it got the name. Two Americans living in London reckoned that the American food there at that time sucked, so they wanted to open a place that served good food and where the poor and the rich could hang out together, a place that treated everybody equally. Can you imagine that an ex-Rolls-Royce showroom serving greasy food across from Buckingham Palace became the most popular restaurant in London. Questioner: And now they’re all over the world. 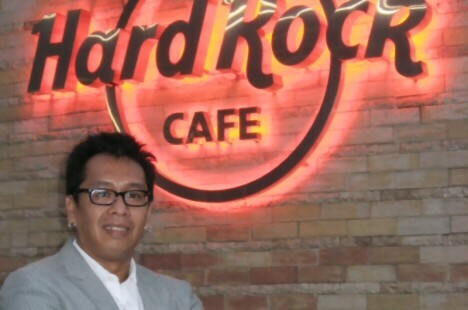 Paulus Panggabean: The Hard Rock logo is one of the 10 most recognized logos in the world. You know you have the Nike Swoosh, Coca-Cola and all that. The survey said that 85 percent of the people recognized the logo. Even if they weren’t sure exactly what it was, they recognized the logo. Question: It must be rough flying from Jakarta to Bali all the time. People probably tell you every day how jealous they are of your job. Paulus Panggabean: Yeah, it’s three weeks in Jakarta and one week in Bali. I’m blessed. Question: What’s the difference between Hard Rock Bali and Hard Rock Jakarta? Paulus Panggabean: The market is different in Bali; we get more tourists. Here it’s more regulars and repeat customers; we have more functions as well. Paulus Panggabean: Actually I have 11 tattoos, but some of them are sleeves. I got my first tattoo when I was 22. There’s an Italian guy who comes to Bali every year. The next time he comes I’m going to get a Tibetan skull with flowers. I’ll have to do it in two sittings. Question: What about the music that plays here at Hard Rock. Where does it come from? Do you guys make the playlist? Paulus Panggabean: Every Hard Rock in the world is given the same playlist. We have this amazing machine called VDS, video data system, and it’s automatically downloading. It’s like a giant DVD player. Every night it automatically downloads or deletes videos. It just plays randomly. Some of the performances are really rare, they’re taken from Hard Rock live shows or other exclusive Hard Rock events. Question: What is your favorite piece of nostalgia here? Paulus Panggabean: I have a guitar from Steve Vai. I know him personally. He did a concert in Jakarta, he’s a cool guy. He used to play guitar for David Lee Roth, then he had a solo project and now he’s part of G3, he and Joe Satriani. Question: You must get comments all the time on the rock memorabilia. What gets the most feedback? Paulus Panggabean: They love the old stuff, you know, the legendary memorabilia. The young guys are amazed by the stuff from Jimi Hendrix and Kurt Cobain. Question: When you’re not hanging out in Hard Rock, where do you go? Paulus Panggabean: I love to go to Dragonfly and I like Blowfish. Question: How often do you guys have concerts? Paulus Panggabean: We have at least two concerts a month, but we have live music every night. We have a house band here. Question: Do you ever get behind the bar and help out? Paulus Panggabean: Yeah, if the restaurant gets really busy, I help out where I can. I used to be a bartender so it’s no problem. Question: Where did the name Hard Rock come from? Paulus Panggabean: There are so many theories about where the name came from. Hard rock was a popular form of music at the time. Another one is that it came from “The Flintstones,” because the cafe is called Bed Rock Cafe. And the third one is a parable. One of the Hard Rock founders [Isaac Tigrett] is a Sathya Sai Baba follower, and Sathya Sai Baba told Isaac everyone in the world is carrying one big boulder, but you chip away your problems and you have one tiny hard rock. But I think the real story is that in 1970, before Hard Rock opened, The Doors put out an album and on the back cover there is a picture of the Morrison Hotel and underneath there is a door that says Hard Rock Cafe. That was a year before the opening. Question: What is the next event you guys are hosting? Paulus Panggabean: Here in Jakarta we have Dance Company on October 2, and on October 9 it’s Andra and The Backbone. HYDERABAD: It’s not just a restaurant, it is a museum of rock culture, with authentic memorabilia from Rock ‘n’ Roll legends covering its walls. After spreading the spirit of Rock ‘n’ Roll around the world since 1971, Hard Rock Cafe, a premium brand with Rock ‘n’ Roll sensibility at its core, is almost ready to rock the city this September. With guitars, racks of clothes, shelves of gold records — it was an incredible sight. ‘Love All, Serve All,’ the motto displayed at the entrance was adopted from Sathya Sai Baba. David Holle, who started as a waiter in Hard Rock Cafe in New York, 25 years ago, is the person choosing the memorabilia for the location. “Hyderabad is an exciting and strategic city for us. The city has its culture and music and I am hopeful that Hard Rock will become the ultimate destination here. It is better known for its atmosphere than its food,” says Anibal Fernandez Lorden, director, Middle East, India, Africa franchise operations and development. The walls are adorned with neat glass showcasing Madonna’s brown bret, Tina Turner’s black ankle boot, Keith Richards’ guitar, Elton John’s sunglasses and nearly 70 other such objects that are treat to a music lover’s eye. Michael Jackson’s black fedora hat is among the memorabilia. The memorabilia being featured in Hard Rock includes some of the most valued and treasured pieces of Rock ‘n’ Roll history. Hard Rock’s Memorabilia Collection has grown over the years through donations, auctions, and acquisitions from some of the world’s greatest musicians and artists. Hard Rock strives to showcase this collection for music fans everywhere while preserving some of the most memorable moments of Rock ‘n’ Roll. It is a brand that believes God is in the details and maintains high quality service at all times. It is not about coffee, it’s about music, finedining and entertainment. The round bar and the inviting restaurant is a major entertainment place, with the popular retail shop on the first level, a must for all visitors. Hard Rock International manages about 115 cafes – 65 of which are they own — across 41 countries. Started by two Americans, Isaac Tigrett and Peter Morton, it opened the first café in London in the early 70s, celebrating the Rock ‘n’ Roll spirit. The Hard Rock Cafe is going to open at GVK One Mall. The birth of Hard Rock International’s memorabilia collection is itself a part of music history. The collection began when Eric Clapton, a regular customer at the original Hard Rock Cafe London, asked the staff if he could hang his guitar on the wall to mark his favourite bar stool as his spot. Hard Rock also derives significant revenue as an accessory retailer. Its merchandise, like T-shirts, lighters, shot glasses and music related products, is city-specific and has reached many markets across the world years before the brand actually set foot there. With more than 130 outlets in 40 countries around the world, Hard Rock Cafe has become a global phenomenon. These treasures include a collection of classic guitars and other instruments, posters, costumes, music and lyric sheets, album art, platinum and gold LPs and photos.